روشنگر, کیومرث, ضرغامی, مهدی, طرلانی آذر, مهدی. (1394). پیش‌بینی مصرف روزانه آب شهری با استفاده از ترکیب الگوریتم‌های تکاملی و آنالیز تبدیل موجک )مطالعه موردی: شهر همدان(. 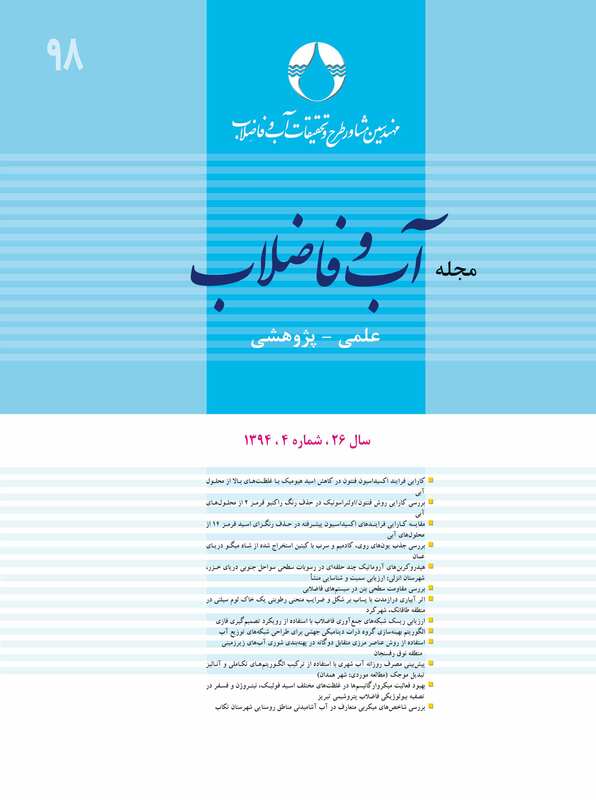 مجله آب و فاضلاب, 26(4), 110-120. کیومرث روشنگر; مهدی ضرغامی; مهدی طرلانی آذر. "پیش‌بینی مصرف روزانه آب شهری با استفاده از ترکیب الگوریتم‌های تکاملی و آنالیز تبدیل موجک )مطالعه موردی: شهر همدان(". مجله آب و فاضلاب, 26, 4, 1394, 110-120. روشنگر, کیومرث, ضرغامی, مهدی, طرلانی آذر, مهدی. (1394). 'پیش‌بینی مصرف روزانه آب شهری با استفاده از ترکیب الگوریتم‌های تکاملی و آنالیز تبدیل موجک )مطالعه موردی: شهر همدان(', مجله آب و فاضلاب, 26(4), pp. 110-120. روشنگر, کیومرث, ضرغامی, مهدی, طرلانی آذر, مهدی. پیش‌بینی مصرف روزانه آب شهری با استفاده از ترکیب الگوریتم‌های تکاملی و آنالیز تبدیل موجک )مطالعه موردی: شهر همدان(. مجله آب و فاضلاب, 1394; 26(4): 110-120. پیش‌بینی تقاضای آب شهری ابزاری مهم برای طراحی، بهره‌برداری و مدیریت سیستم‌های تأمین آب شهرها به‌شمار می‌رود. تعدد عوامل اثرگذار بر تقاضای آب شهری و تغییر اثر آنها با تغییر شرایط، باعث ضعف روش‌های تحلیلی ریاضی سنتی در این زمینه شده است. تا‌کنون روش‌های متعددی برای پیش‌بینی تقاضای آب شهری مورد استفاده قرار گرفته است که الگوریتم‌های تکاملی از پرکاربردترین آنها است. در این تحقیق از ترکیب روش برنامه‌ریزی بیان ژن که سرعت همگرایی و دقت بالایی در محاسبات و شبیه‌سازی دارد، با آنالیز تبدیل موجک برای پیش‌بینی تقاضای روزانه آب در شهر همدان استفاده شد. مصرف آب روزهای قبل و پارامترهای اقلیمی به‌عنوان عوامل مؤثر بر تقاضای آب در نظر گرفته شد. در بخش اول این مطالعه، کارایی روش برنامه‌ریزی بیان ژن در پیش‌بینی تقاضای روزانه آب شهری مورد بررسی قرار گرفت و بهترین مدل برای پیش‌بینی تعیین شد و در بخش دوم، تأثیر آنالیز تبدیل موجک بر نتایج، ارزیابی شد. بر اساس نتایج حاصل، مدلی با ورودی‌هایی شامل مصرف آب یک، دو، سه و هفت روز قبل بهترین مدل برای پیش‌بینی تقاضای روزانه آب، در مطالعه موردی حاضر است. ترکیب روش برنامه‌ریزی بیان ژن با آنالیز تبدیل موجک نتایج پیش‌بینی را تا 10 درصد بهبود می‌بخشد. Water demand forecasting is an important tool in the design, operation, and management of urban water supply systems. The wide variety of factors affecting urban water demand and the variations in the impact levels of these factors due to changes in environmental conditions have undermined the efficiency of conventional mathematical forecasting models in forecasting water demand. Different methods have been so far employed for urban water demand forecasting, among which evolutionary algorithms are the most widely used. In this study, the gene expression programming model, which has a high convergence speed with high precision in calculation and simulation, is combined with the wavelet transform analysis to derive a hybrid model for forecasting daily water demand (consumption) in the city of Hamedan. Water consumption of previous days and climatic parameters constitute the factors affecting water demand in this model. In the first part of the present study, the efficiency of gene expression programming models in forecasting urban daily water demand is investigated to identify the best model (i.e., the best combination of inputs). The second part is dedicated to the evaluation of the effect of wavelet analysis on the results obtained. The results indicate that the best model for forecasting daily water demand is the one with water consumptions of 1, 2, and 3 previous days as well as those of the preceding week as its input. It is also found that the combined gene expression programming and wavelet transform analysis leads to a 10% improvement in forecasting results. 1. Qi, C., and Chang, N. (2011). “System dynamics modeling for municipal water demand estimation in an urban region under uncertain economic impacts.” J. of Environmental Management, 92, 1628-164. 2. Zhou, S.L., McMahon, T.A., Walton, A., and Lewis, L. (2000). “Forecasting daily urban water demand: A case study of Melbourne.” J. Hydrology, 236, 153-164. 3. Stark, H.L., Stanley, S.J., and Buchana, I.D. (2000). “The application of artificial neural networks to water demand modeling.” Annual Conference Abstracts of Canadian Society for Civil Engineering, Montral, Canada, 139. 4. Kim, J.H., Hwang, S.H., and Shin, H.S. (2001). “A neuro-genetic approach for daily water demand.” J. Civil Engineering, 5(3), 281-288. 5. Altunkaynak, A., Özger, M., and Cakmakci, M. (2005). “Water consumption prediction of Istanbul city by using fuzzy logic approach.” Water Resources Management, 19, 641-654. 6. Tabesh, M., Goosheh, S., and Yazdanpanah, M. J. (2006). “Short term water demand forecasting of tehran city by artificial neural network.” J. Tehran University Engineering Faculty, 41(2), 11-24. 7. Msiza, I.S., Nelwamondo, F.V., and Marwala, T. (2007). “Water demand forecasting using multi-layer perceptronand radial basis functions.” In Proceedings of the IEEE International Conference on Neural Networks, IEEE, Orlando, FL. 8. Tabesh, M., and Dini, M. (2009). “Fuzzy and neuro-fuzzy models for short-term water demand forecasting in Tehran.” Iranian Journal of Science and Technology, Transaction B, Engineering, 33(B1), 61-77. 9. Babel, M.S., and Shinde, R. V. (2011). “Identifying prominent explanatory variables for Water demand prediction using artificial neural networks: a case study of bangkok.” Water Resources Management, 25, 1653-1676. 10. Herrera, M., Torgo, L., Izquierdo, J., and Perez-Garcıa, P. (2010). “Predictive models for forecasting hourly urban water demand.” J. Hydrology, 387, 141-150. 11. Campisi-Pinto, S., Adamowski, J., and Oron, G. (2012). “Forecasting urban water demand via wavelet-denoising and neural network models. Case study: City of Syracuse, Italy.” Water Resources Management, DOI: 10.1007/s11269-012-0089-y. 12. Nasseri, M., Moeini, A., and Tabesh, M. (2011). “Forecasting monthly urban water demand using extended Kalman filter and genetic programming.” J. Expert Systems with Applications, 38, 7387-7395. 13. Kisi, O., and Shiri, J. (2011). “Precipitation forecasting Using wavelet-genetic Programming and wavelet-neuro-fuzzy conjunction models.” Water Resources Management, 25, 3135-3152. 14. Fernando, A.K., Shamseldin, A.Y., and Abrahart, B.J. (2012). “River flow forecasting using gene expression programming models.” In Proceedings of the 10th International Conference on Hydroinformatics, HIC 2012, Hamburg, Germany. 15. Kisi, O., Shiri, J., and Nazemi, A.H. (2011). “A Wavelet-genetic programming model for predicting short-term and long-term air temperatures.” J. Civil Engineering and Urbanism, 1, 25-37. 17. Kavehkar, S.H., Ghorbani, M.A., Ashrafzadeh, A., and Darbandi, S. (2013). “Simulation of water level fluctuations using gene expression programming.” J. Civil Engineering and Environment, 43(3), 69-75. 18. Ferreira, C. (2001). “Gene expressionprogramming: A new adaptive algorithm for solving problems.” Complex Systems, 13(2), 87-129. 19. Toofani, P., Mosaedi, A., and Fakheri Fard, A. (2011). “Prediction of precipitation applying wavelet network model (case study: Zarringol station, Golestan province, Iran).” J. Water and Soil, 25(5), 1217-1226. 20. Zolfaghari, M., Aminnaaseri, M.R., and Beshatatnia, F. (2011). “A combined model from artificial neural network, wavelet converting, and arma in predicting the demand for urban water.” J. KnowledgeandTechnology, 5, 95-119.